29 Dec. 2016– The new Speaker of Parliament, Hon. 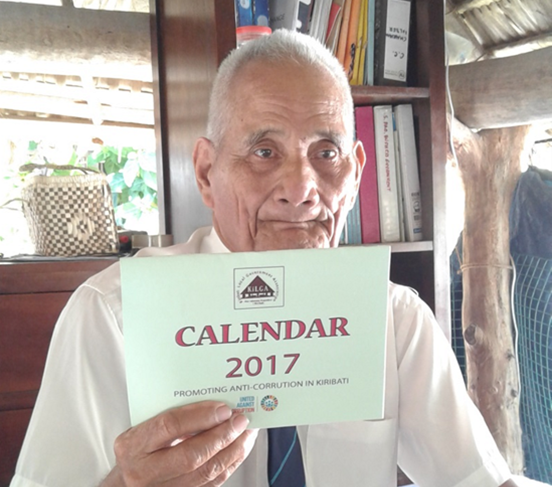 Tebuai Uaai, was among many VIPs given a free copy of the KiLGA’s 2017 Anti-Corruption Calendar and one of the few acknowledging receipt with appreciation. The Calendar contained quotations and cartoons to promote anti-corruption in Kiribati and was published with funding from the UN Office on Drugs and Crime (UNODC). The Calendar, also containing names of newly-elected Mayors, was launched during the Anti-Corruption Day celebrated in early December 2016 at the Bairiki Square. The photo shows another recipient of the Calendar, Magistrate Raratu Ieita, who expressed praises for the quality of the quotations and predicted that it would be useful for anyone, especially leaders. KiLGA was involved in a review of the Local Government Act, carried out at various times in December, 2016, coordinated by Teewa Tonaeka of the Local Government Division (LGD) of MIA. Other local experts involved include Rine Ueara, former Director of LGD and Chief Electoral Officer and many more selected senior government officials. The Review also included points raised in the ‘Tweedie Report’ made in 2014 by Steven Tweedie, who undertook a review of the Local Government system, funded by CLGF. One of the key changes agreed to by the Review Committee, which was also recommended by Mayors during the third Mayors General Meeting in April 2016, is the need to have Mayors continue in their office after the Councils are dissolved for new elections, until the new Mayor takes over. Currently it is the Council Clerk that takes on that office. 30 Nov.2016—Ms. 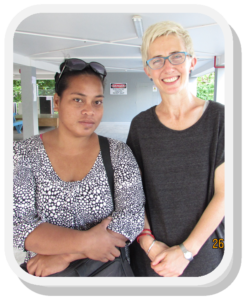 Tanya Caufield, a KIT consultant from the Melbourne University visited the KiLGA’s Office to seek information on how KIT can best serve vocational training needs for people in the outer islands. She is part of the Australian Aid Programme aimed at providing training for youths who are out of school. She was informed that there is a high demand for training by Council employees, most of whom live and work on the outer islands and that KiLGA would be happy to encourage and support KIT on such training initiatives. 5 Dec. 2016—A joint-sponsorship by ChildFund (NZ) and the Ministry of Foreign Affairs and Trade (MFAT) of NZ, allowed KiLGA’s Executive Officer (EO), Rikiaua Takeke, to attend the DevNet Conference at the Victoria University of Wellington. At the conference the EO made a joint-presentation with Ms. Shona Jennings, the Programme Director of ChildFund NZ, that explained the Viable Systems Model used in the partnership between ChildFund, KiLGA and the Betio Community. The EO also chaired a Development Practitioners’ panel which saw a presentation by CARITAS New Zealand on a survey done in Kiribati for the Catholic church, among others. 6 Dec.—The EO accompanied ChildFund senior officials to a meeting with MFAT at its office in Wellington, to promote the Kiribati ChildFund Project in Betio. 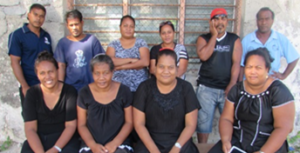 The EO provided additional information on Betio, KiLGA and Local Government in Kiribati. KiLGA and ChildFund have signed a Teaming Agreement to work together on a project at Betio village, (with a possibility of replication in other Councils in the future) aimed at improving economic and social conditions for children, with funds being sought from MFAT. 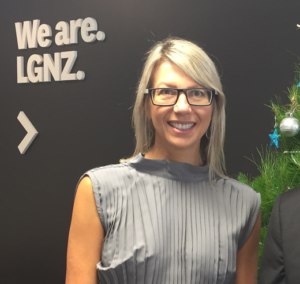 Later that day, the KiLGA’s EO, accompanied by Shona Jennings of ChildFund, visited Ms. Helen Mexted, (pictured below) Deputy Chief Executive Advocacy of the Local Government Association of NZ (LGNZ), at the Association’s main office in Wellington. The meeting between the officers was brief but allowed the KiLGA’s EO to express the interest of KiLGA in developing a partnership with the LGNZ on various areas including Bulk Purchase and Exchange schemes. 8 Dec. Auckland—The KiLGA’s EO was invited to meet the staff of ChildFund NZ in their HQs. About 20 staff of the NGO were present including the Chief Executive Officer, Paul Brown. Shona Jennings, the Programme Director of ChildFund facilitated the gathering, during which some of the staff asked questions about KiLGA and its work in Kiribati. DevNet Seminar with KiLGA’s Executive Officer, Rikiaua Takeke (Centre). 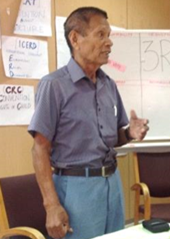 29 Nov. 2016 —The new Chairman of KiLGA, Mayor Taoaba Kaiea of TUC (pictured) was briefed on his roles for the Association by KiLGA staff, at a session held at his TUC office in Teaoraereke, witnessed by Vice Mayor of TUC, Cllr. Raurenti Toatu. The Chairman’s roles include chairing both the Association’s Executive Board and General Meetings, being a trustee of the Association’s financial documents and the chief spokesperson for KiLGA. A similar briefing was carried out for the Deputy Chairperson, Mayor Tauia Viane Taoaba (BTC), a few days later. Both the chairman and the deputy chairperson took over from Mayor Ruoikabuti Tioon and Mayor Romano Reo, respectively. Since KiLGA’s establishment in 2012, there have been three chairpersons, namely, Mayor Romano Reo (founding chairperson with two terms), Mayor Ruoikabuti Tioon and the current chair. 3 Nov. Suva—The KiLGA’s Executive Officer attended the Pacific Island Forum Secretariat’s (PIFS) NSA Seminar aimed at strengthening the participation and involvement of NSAs (or NGOs) in the Pacific region. The invitation resulted from a paper submitted by KiLGA explaining the use of the Viable Systems Model in developing its partnerships with ChildFund. The seminar was useful in connecting KiLGA with donor representatives based in Suva, such as the EU, DFAT, and MFAT, among others. 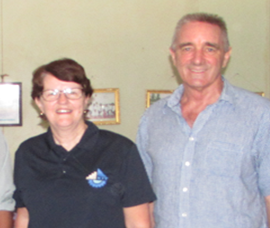 28 October, BTC – Julie Kean, the new Principal of the Kiribati Training Institute, revealed her visions for providing relevant training programmes for Kiribati youths, including those on the outer islands, during a meeting with ChildFund’s Rick Steel and the KiLGA’s Executive Officer. The Principal said that KIT is introducing a Foundation and Bridging Programme aimed at providing TVET courses relevant to youths who have missed out, or felt left out of mainstream education, and who would like to have a fresh start in life and be given the opportunity to get employment or pursue higher education. The Bridging programme, which is aimed more specifically for outer island youths, who do not have senior-level education, is very much welcomed by KiLGA, which has the responsibilities of providing capacity building for Council employees. ChildFund and KiLGA have been working together since they, together with BTC, signed a Partnering Agreement in October 2016, to run a pilot project for improving children’s conditions in the Betio Village area, once funding assistance from the New Zealand government is secured. One of the project’s components is setting up a Youth Learning Centre to provide training on life– and communication-skills, which fits in well with the KIT Principal’s visions and plans. The meeting agreed that there are synergies in the KIT, ChildFund and KiLGA’s plans and noted KIT’s willingness to assist in the development and resourcing of the ChildFund’s proposed Youth Learning Centre and support to KiLGA’s plans on the training for Council staff. The funeral service for Hon. 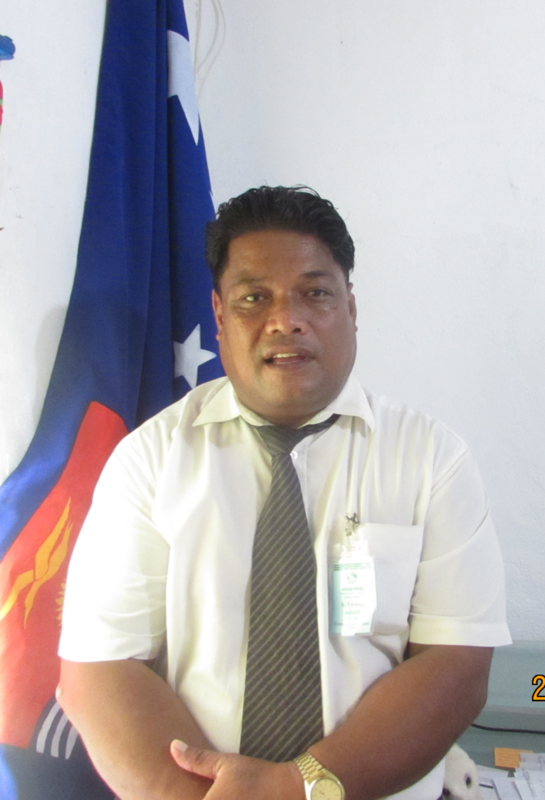 Teatao Teannaki, Speaker of Parliament, took place on 18 October, 2016, witnessed by nearly everyone in Kiribati, via a live radio coverage. The Honourable Speaker was also a former Beretitenti of Kiribati, former Vice President, Cabinet Minister and MP for Abaiang, covering a record period of almost four decades. The Beretitenti of Kiribati, H.E. 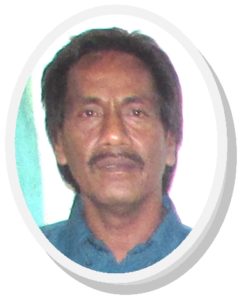 Taaneti Maamau, was present at the church service to award, posthumously, the “Ana Tokabeti Kiribati” medal, the highest national leadership award, to his widow, on his behalf. Speaker Teaotao Teannaki was a well-known and –respected leader in both national and local governments. 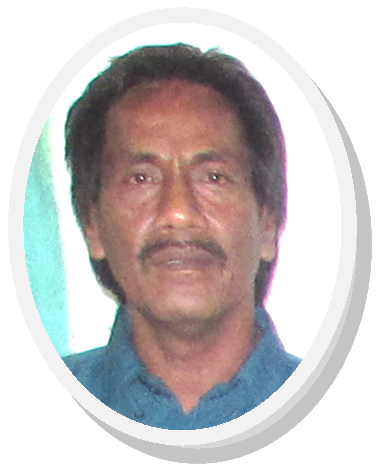 He has been the only I-Kiribati to have filled top government positions in both the Executive and Legislative branches of government. With regards to his work for Local Government, he had been a very active and effective Ex-Officio member of the Abaiang Council for 40 years. Because of this outstanding leadership record, he was invited to be the Guest Speaker at the ‘Abaiang IDC Workshop’, on 21 October, 2015, held at the Parliament conference room, sponsored by SPC, USAid, GIZ and others. The workshop was aimed at developing the capacity of the members of the Island Development Committee of Abaiang, especially in combating and adapting to Climate Change and natural disasters. Hon. Teannaki gave an inspiring talk on the topic of ‘Effective Leadership’, which he illustrated with good practices from his own experience. He defined an effective leader as ‘one with the ability to get consensus amongst his Council or organization.’ The audience were very appreciative, and also deeply moved, many wiping tears from their eyes at the conclusion of his talk. Hon. Teatao Teannaki had been a model of an effective leader, known to many, both locally and internationally, and stands to be remembered and copied by many, today and in the future. KiLGA bids him to rest in peace and offers full condolence to his widow and family. On 12 July, H.E. 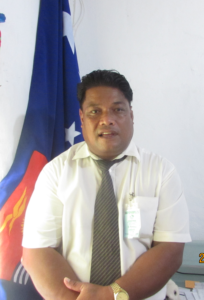 Beretitenti Taaneti Maamau, presented Mayor Teepa Manaia of Kuria, the medal of ‘Kiribati Long Service and Good Conduct Award’ or Kanikanaean te Bekumwaka ma te Kakaonimaki (KBK). The award was a deserving result of the good leadership demonstrated by Mayor Tepa Manaia over the years. KiLGA also recognized the Mayor’s achievements during its third General Meeting held on 6th April, at USP campus, in Teaoraereke, when it created an award that would be presented to Mayors with outstanding leadership and achievements and approved Mayor Teepa Manaia to be the first recipient. He was awarded the honour during the Gala Night sponsored by LMTA at its restaurant in Antenon that marked the closing of the General Meeting. Secondly, the Mayor during his first term in office, turned around a Council with a poor cash flow and a staff that had not received salaries for several months, by first, borrowing money from the Island Cooperative Society in the amount required to settle all outstanding accounts, including unpaid salaries, and then focusing on generating revenues to settle the debt and, eventually, as is the case today, make Kuria Council one of the wealthiest with surplus funds invested offshore. Thirdly, the Mayor had demonstrated his wisdom and leadership during a conflict between the Unimwane and the Council, when the former took over and implemented development projects earmarked for the latter. By refraining from confronting the Unimwane, believing that what they did would eventually benefit the people, he maintained order and harmony on Kuria. Then, a survey conducted by MIA of all Councils’ financial performance for the period 2013-15, showed Kuria Council at the top slot in all the years, with the best overall score.